Builder : Hunslet Engine Co. 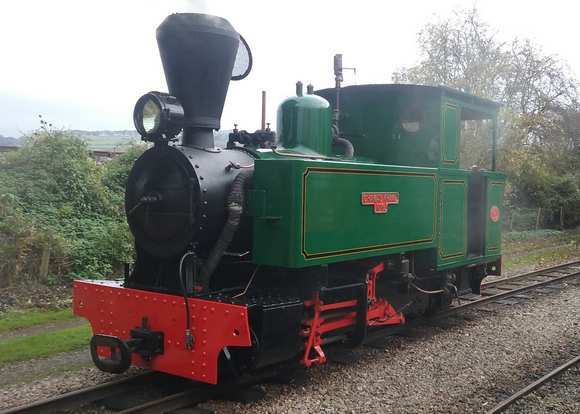 This locomotive was built by the Hunslet Engine Co. Ltd. of Leeds (Works No. 2075) in 1940 and is a 0-4-2T weighing 15 ½ tons in working order and is capable of hauling 320 tons on the level. The original design was by the Avonside Engine Co. Ltd. of Bristol which closed down in 1934 when Hunslets acquired the goodwill. This locomotive spent all its commercial working life in the South African sugar cane industry being delivered to Gledhow Chakaskraal Sugar Co. Ltd. for use on their estates in Natal. It was purchased by a group of members and returned to this country in 1981 after languishing for many years outside a Country Club. For about ten years at the end of the last century it was on loan to the South Tynedale Railway at Alston. A short appearance was made on the Welsh Highland Railway at Portmadog in 1988.